At Renasi, all accessories are handmade in house. 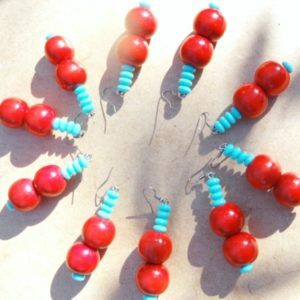 The type of beads used are: wooden, acrylic, seed beads and resin. Nearly all materials used are sourced locally. The current product offerings include: necklaces, earrings, bracelets and key rings. It is the intention of the company to broaden its product range in the near future through collaborative efforts with artisans in South Africa and Internationally. By paying attention to customers’ preferences and also keeping abreast with changing fashion trends, Renasi aims to continue to create jewellery and accessories for women that are functional, elegant and timeless.